It's been such a short time between my last jam and this one! But it's Ludum Dare, so it's worth the effort! The theme this time was: You are the Monster. 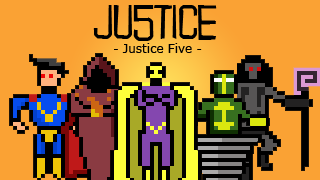 And based on this theme I developed the game Justice Five. You have been affected by radiation and now everyone thinks you are a monster! The infamous Justice Five decides you are a threat. Fight the powerful members of the Justice Five and prove to them that you are not the monster everyone thinks or... just show them how right they are. I have to say that, initially, the theme didn't hype me so much. I had two ideas: the first was about you controllling a monster, kinda like if you were playing a monster in a Tokusatsu movie. It could be mechanical or just a suit. The mechanics would revolve around the monster's movimentation in order to accomplish certain feats. The second idea was about a group os superheroes and you: a transfigured creature with powers as great as theirs but excluded by the society. Well, you already know which one I picked, right? The ideas for this game were just coming and coming. Just when I finished a level, the design to the next one would ping in my head. Since this is my third time participating in Ludum Dare, my time management is becoming quite good. I already had an idea of how much time I would spend in each area of the project. This was the first game where I created 100% of the sprites and animations and it felt really good, because I actully liked them (most of the time I hate the sprites I create). I planned to use Autotracker for the soundtrack in this game, but... The tracks just seem the same. I wanted a custom music for each of the bosses and Autotracker wasn't doing a very good job. After Googling a little I found this amazing software called cgMusic, which helped me create very good songs for Justice Five! Once again I used Construct 2 and at the very end of development, I ran out of events... I thought I would need to cut part of my original idea for the game, since all 5 levels were already done, but I managed to free some events and fit everything there. Since I don't have money to buy the license for now, I guess it's time to try out different engines for the next jam.